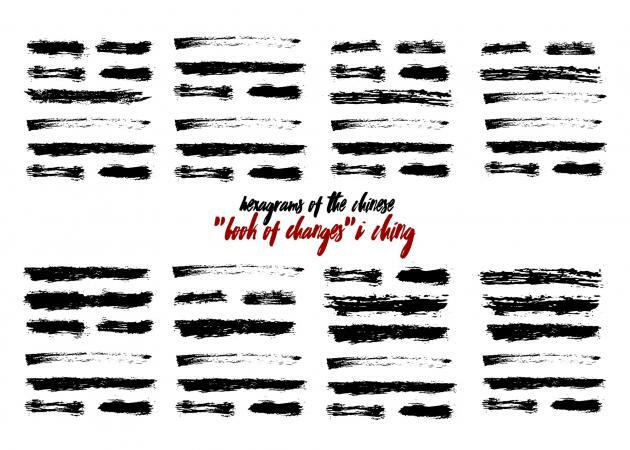 The I Ching (it's pronounced ee ching with a long e), or Book of Changes, is an ancient Taoist and Confucianism text people around the world use to find guidance and direction in their lives. Consulting the I Ching can provide both general wisdom about your path and life and guidance for specific small and large issues that arise. Gather your supplies. You'll need an I Ching interpretation, such as The Everyday I Ching by Sarah Denning or the I Ching or Book of Changes by Brian Browne Walker, a pen and paper, and three coins (you can use traditional feng shui coins or choose regular coins, such as a quarter since all you need are coins with heads and tails). Choose a spot where you won't be bothered that has a flat surface where you can cast your coins and write. Hold the coins in your hand, focus on them and say aloud or in your head, "Tell me what I need to know." Toss the coins six times, recording the patterns of heads and tales for each. Your reading will consist of two trigrams (two sets of three lines each). You read the trigrams from bottom to top. Most guides show how to record these to make a hexagram in the beginning or the end of the book, or you can consult the video below. Turn to the page of your I Ching that lists the hexagrams (or use this online hexagram chart). Typically, you'll find the bottom trigram running along the side of the chart and the top trigram running along the top of the chart. Locate each trigram and then find their row and column intersection. On the chart, it will be listed as a number. This is your general I Ching reading number. Turn to the section that has that number as the header and read the information there. This is your general guidance for the day. Give thanks to the I Ching and the coins for their guidance. Then, in your meditation, meditate on the messages you have received. Often, the answers from the I Ching become much clearer upon reflection. You can also consult the I Ching for guidance with specific issues. If you're using coins, the process outlined above works well although you can also use I Ching apps or websites, as well. To consult, hold the coins in your hands and focus on your question. You may even wish to write the question on the piece of paper you are using to draw your trigrams. When you feel ready with your focus on your question, cast your coins and then consult the I Ching to find your answer. Some topics where you might consult the I Ching for guidance include the following. How can I strengthen my relationships? What do I need to change within myself to be ready for romantic love? How can I improve communication with my partner? Career questions you can pose to the I Ching include the following. How can I find the perfect job for me? What are some ways I can better serve my life's purpose in my job? While many people conflate life's purpose with career, often they are not the same although your career may be contributing to your life's purpose. Some questions you can ask about life purpose include the following. What is my purpose in life right now? How can I align more closely with my life's purpose? One of the best times to consult the I Ching is when you have reached a crossroads in your life. Focus on the questions you have about any decision you need to make and then cast the coins and read the interpretation using the method above. The wisdom in the answers can help you find the best way to move forward. The I Ching and feng shui are deeply interconnected, and some people also consult the I Ching in feng shui. The wisdom of the I Ching and the trigrams are all part of feng shui, and practitioners may consult it for deeper insights. The trigrams are also part of the feng shui bagua and are representations of each of feng shui's elements. The I Ching is filled with ancient wisdom for those who seek it. While the answers may not always seem straight forward, when you reflect upon the words and how they apply to your situation, you will discover this ancient book is just as prescient in the modern day as it was when it was first created.